Bring me the big knife is a quote from one of our favorite movies, MOONSTRUCK, starring Cher and Nicholas Cage. The Big Knife scene is inside Ronnie Cammareri’s (Cage) basement bakery, and when he’s reached the end of his patience with his situation, he yells for his employee Chrissy to bring him the BIG KNIFE so he can end it all. Moonstruck is a great movie for Valentine’s Day. In the storyline, when people do the wrong thing, it is called the wrong thing, and not glossed over as their right or celebrated. In the movie people actually acknowledge wrongdoing, believe in God and the church, and try to make things right in their lives. By the time the credits roll you feel like you are a part of their family. 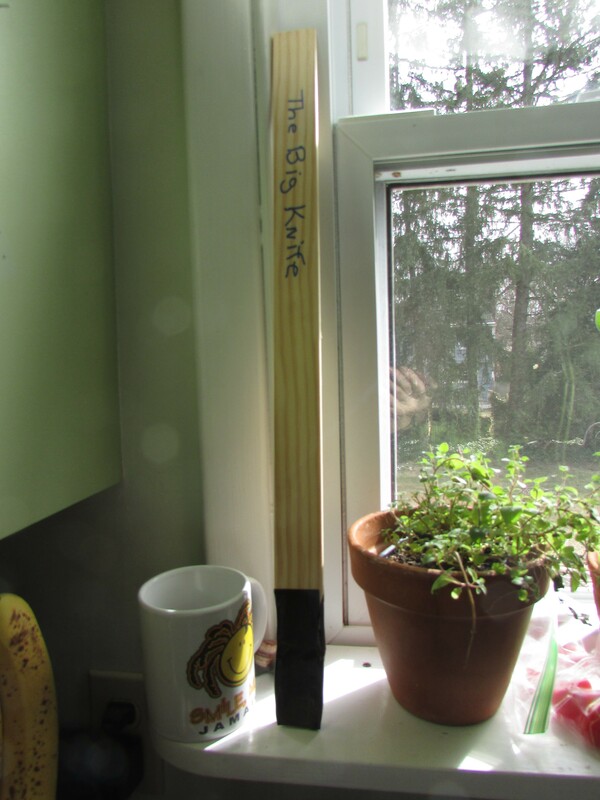 For me, true love is a paint paddle made into a “Big Knife” by my husband a week or so ago. He knows I have been having a difficult time in several situations, and to make me laugh, he brought me THE BIG KNIFE. Would anyone else in the world know how meaningful this paint paddle is for me besides him? Well maybe now you will too. True love…priceless…and sometimes in the form of a Big Knife. Happy Valentine’s Day. It’s one of my top ten! Yes! Thank you for this and I love your “Big Knife” story! That husband is a keeper! Gonna watch Moonstruck tonight! Yep, I think I’ll try and watch Moonstruck tonight too. I’m not sure if I’ve watched it before or not – it’s not sounding familiar, so thanks for the suggestion! It was an 80’s movie and such a sweet story. Happy Valentine’s day. Thanks for the movie recommendation. I will see if I can get it. It is good and right to call a spade a spade. And what a Valentine’s day gift- the gift of laughter. Thanks Susie! I think you will enjoy it. Thanks Anne. Happy Valentine’s Day!